I first found your site about a week ago through Alice Q's blog - but now you list it on ch -wonderful! I wish I knew about it before! 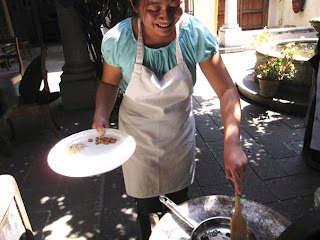 I've been reading some of your archive - even a Super Cocina Post! Yay.. I would love a recipe to make my own Ban Xeo - the video - to understand the technique is great! Mom's are the best. You should come to the chowdown on Saturday at the Imperial Ave. Farmers Market at 10am. Josh, Alice Q, Jturtle, joseph and Epicurious eggplant will be there with me. Are you on the SDChow list? I'm so excited that Alice linked my blog! I'm not sure how she found it, although it could have been that phantom post to the Banh Xeo thread (the thread never updated, but the post wasn't deleted until I alerted the mods). Anyhoo, I'll post a recipe after I see my mom next weekend (Chinese New Year... food!!!). I'd love to join the SDChow list... wasn't sure how to do it. Do I have to open a Yahoo account? Thank you for inviting me to the Chowdown! I'd love to come, but we'll be shopping for our Super Bowl party on Sat. morning. Next time, perhaps? For the shopping, there will be a stop at Northgate for sure, so I'll post about it. I think all you have to do is click on the blue Join button, gf. We'll have to decide on a next chowdown after this one - I wonder where? Have fun shopping - you should check out that little candied fruit stand in the front. The coconut stuffed limes are really good. For the nopales - I think the easiest way is to gut them into halved green bean sized stips and boil them until they change color - cool and mix with diced onion cilantro tomato chile and olive oil and lime. Sprinkle with cotija cheese and toasted pumpkin seeds. You could also roast the whole paddles with some oil. Top with cheese and grilled carne asada. for a huarache azteca - an aztec sandal. Serve with slices of avocado. My favorite salsa is a chile de arbol and grapefruit juice - the color is amazing! Buy some chile de arbol and fry with some cloves of garlic in olive oil till slightly under charred- toss cooled into blender and add fresh squeeze grapefruit juice and salt. Really good. So...I managed to track you down...he-he-he. You got conch in the Bun Rieu...that's odd, we've always had Oc, they must've run out. If you enjoy Cha Lua - try out DaNang Food to Go on ECB. I liek their version. Hi, Kirk! Wow, it's a little CH reunion off-site. I hope you don't mind that I've linked mmm-yoso to my links section. I do love cha lua. It's been a while since I've had a good loaf (log? link? what's appropriate?) to munch on. I'll have to check out DaNang.